The infamous first trip photo. | Normal Is Over. The infamous first trip photo. 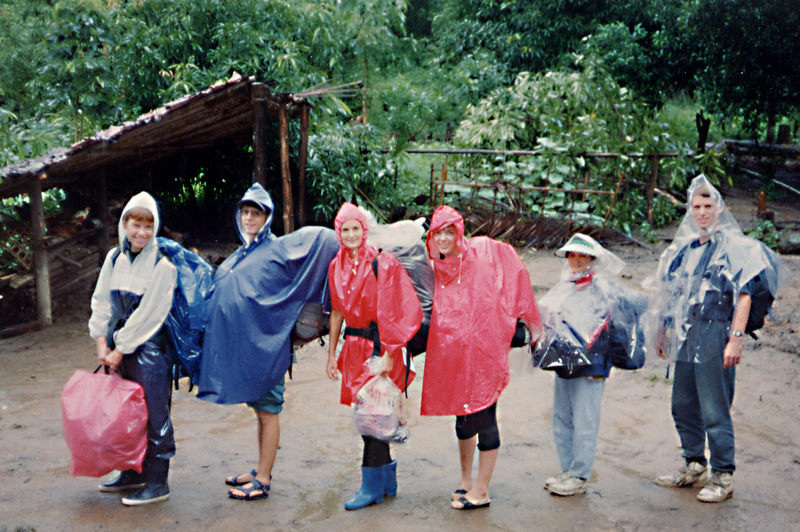 In Mae Saliit Kee, above Sho Klo Refugee camp in 1994. Left to Right: Oddny Gumaer, Steve Gumaer, Christy Cunningham, Samantha Ryan, Lucy Williams, and Jeff Williams. Our first ‘team’ on our first ‘outreach’: Oddny and Christy in rubber boots swore to the merits of their foot gear for rainy season movement. Ironically Oddny’s galloshes were Viking brand. To save 50 cents, Jeff made he and his wife to be ponchos from stiff clear plastic. Jeff never did admit that he was the one who kept breaking wind in the hotel room. The girls stayed dry but quit the boot habit after our trip. The ponchos didn’t really work but made great conversation. And yes, it was you smelling the room up, Jeff! Haha. I still wear rubber boots. And they are still called Viking.